“Poetry is just truth, slanted,” Emily Dickinson slyly remarks some 10 minutes into the play, turning away from her bedroom window to address the audience in the darkness beyond. 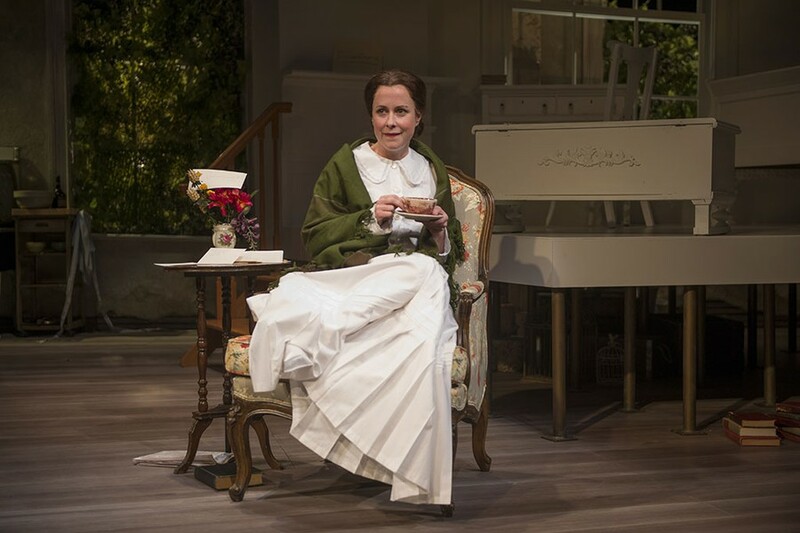 In many ways, it is this duality between the realities of the world and how each individual chooses to see these realities that frames the emotional hearthstone of The Belle of Amherst, a one-woman show about the life of Emily Dickinson now showing at the Court Theatre. Featuring Kate Fry as Dickinson and directed by Sean Graney, the narrative juxtaposes Dickinson’s isolated existence in a small town of 19th-century New England with her contextual circumstances. Her circumstances are more than simply geography; they somehow make her ability to find happiness in such a wilderness all the more meaningful and poignant. Stripped of all outside distractions—with only one character, one set, and one voice—the audience’s focus is stereoscopically aimed at this one central figure and the emotional consequences of her actions. In Dickinson’s isolation, her joy in her collection of birds becomes a triumph, her scheming against the small-minded townspeople who pry into her is a Hamletian tale of social deception, and her father coming home from work early seems an immeasurable disaster. There is nowhere to hide for the character or the audience, and the consequential magnification of such emotion is oppressively profound. Fundamentally, this is a play about finding joy in unhappiness, rather than the other way around. The internal cadence of the play is punctuated by constant grief—from the rejection of her work to the death of her family members. Each twisted moment is skewered and etherized onstage in all its gory detail. Dickinson’s resilience becomes the heroic thrust of the narrative, and each wry smile and childish giggle shines like a beacon through the emptiness around her. Even the stage design reflects this distilled isolation that circulates the narrative. Built upon an irregular perspective, as a stage within a stage, a large, cluttered central living area frames an internal and elevated stage of a white bedroom. Interior versus exterior, internal versus external; the literal stripping away of walls and layers separating the two represent the simultaneous dichotomy and juxtaposition of the two segments of her life. Furthermore, it is in the interplay between the two, both in contrast with design and the ways in which Dickinson transverses this space, that her own internalized journey through her life shows through. The outer layer, while domestic and cozy, is filled with pictures of her family and living plants but is fraying at the edges and slowly crumbling. The inner layer contains a pristine white bedroom, framed by a distinct lack of chiaroscuro and bathed throughout the play in various pastel shades, like some large James Turrell exhibit. Both parts exist simultaneously, constantly in contact with one another, but Dickinson herself only ever exists in one at a time and is only ever illuminated in one. The narrative of her life mimics the framing on stage; her entire existence and her fragmented memories exist simultaneously, yet only the present within her mind gets illuminated. Dickinson herself admits embarrassedly at the beginning of the play that she has gotten into the habit of “tripping through time"; indeed, she exists concurrently in memory and reality. It seems amiss to cover a play about Emily Dickinson without mentioning her poetry and its immense impact. Though The Belle of Amherst is more so about her life than her work, it is almost impossible to extricate the two. The play goes far to illustrate how her poetry isn’t just a projection of the realities of her life, but a symptomatic representation of such. The language of her poetry seamlessly ties into the natural dialogue of the play. Dickinson’s poems aren’t just her life recreated on paper, but rather a direct representation of the ways in which she sees her life through the refractive prism of her mind. There’s something inherently tragic about the constant rejection of her work, as we watch her self-worth degenerate to the point to which she even begins to refuse offers for her work to be published. Her posthumous recognition becomes bittersweet, and the audience’s mood dilate; figuratively and literally, she leaves the audience with all her poetry in a box as the lights fade to darkness. Poetry is just a slant on the truth after all, but now that the audience understands her experience more fully, does that really matter? The Belle of Amherst is now showing at the Court Theatre, running until December 3. The original play was written by William Luce and released in 1976. Discounted tickets are available for UChicago students. Contact the Court Theatre ticket office for details.